Working down from the biggest (501+), the 1000-seat range is easy to discuss. Average? 1000. Mode? 1000. Three respondents think 1000-seat venues are ideal. These respondents have a few options, among them Goucher’s Kraushaar Auditorium, Coppin’s Johnson Auditorium, Hopkins’ Shiver Auditorium. From the venue responses discussed earlier, these respondents seem to have settled on Goucher’s Krashaar Auditorium (no respondent mentioned Coppin or Johnson or Hopkins or Shriver). Kraushaar’s size matches their reported ideal, they already know about it (Kraushaar is specifically mentioned twice and Goucher two additional times) and from the neutral-to-positive assessments, these dancers have a place to perform, even if they’re not completely happy with the cost. That conclusion is a bit of a leap of logic, so picking out those three respondents, what more can we learn? Combined, these three respondents claim 30 performances per year, and provided only UMBC’s Black Box and Kraushaar Auditorium as specific performance locations (other responses were generic locations). UMBC’s black box capacity is in the 100-120ish range, so isn’t going to work for a 1000-seat ideal. Looks like for these big shows, Kraushaar is the place. At least one-third of respondents looking for a 1000-seat venue already use Kraushaar. Focusing next on just on the middle range (251 to 500 seats) with the chart above, our average in just this segment is now 383 seats, most common in this range is 300. Baltimore City has several venues that satisfy the middle range, among them Lithuanian Hall, BMA Meyerhoff, MICA Brown Center Hall, and MICA Falvey Hall. There are also a few more in the suburbs, among them AACC Pascal Theater, Garrison Forest Garland Theater, Olney Historic Stage, and the McDonogh Horn Theatre. What say the respondents for actual performance spaces? 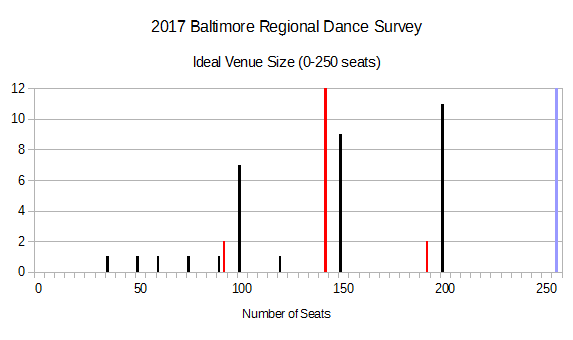 For respondents indicating an ideal seating capacity of 251 to 500 (there are 18 respondents that fit), when asked where they actually did perform, the BMA is only mentioned twice. Slayton House (240 seats) got three mentions, Howard Community College (probably the Smith theater – 424 seats) got two mentions (but is not available to outside organizations), the Gordon Center (550 seats) was mentioned twice, Morgan and the Murphy Fine Arts Center were both mentioned (probably the Turpin-lamb Theater – 271 seats), Towson was mentioned two times, but there are just too many potential spaces on that campus to guess (Seating capacities are 680, 500, 320, 120, 100, and the Dance Studio Theater seats only 60). On a purely seat-count measure, BMA Meyerhoff comes in at 363 seats, compared to our average in this segment of 383 and Turpin-Lamb comes in at 271 compared to our mode of 300. Those looks like the winners, but apparently not very popular within this group of respondents (only 2 of 18 respondents reported using each of these spaces in 2016, so that’s only about 11%). For respondents with production expectations at this scale, being stuck in a smaller venue could be a real problem. 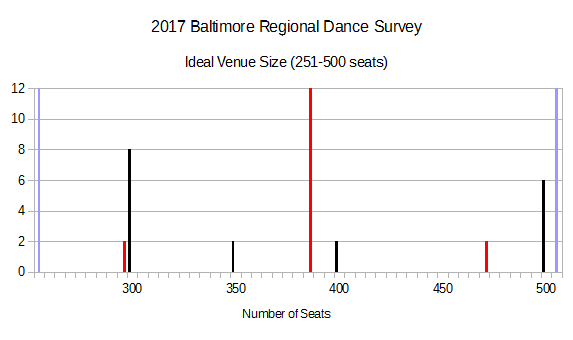 A few respondents may fall into this category, with performances at Creative Alliance (210 seats), Towson’s “Black Box” (could be the Marder Studio Theater at 100 seats), Howard County Center for the Arts (118 seats), and a couple respondents that mention Morgan (which is more likely to be the Turpin-lamb space at 271 seats than the Gilliam space at 2036). Finally, the smallest venues, and the most complicated facility-match. Within this segment, our average is now 142 and the mode is now 200, based on 33 respondents. As you would expect, smaller venues are much more abundant. Options in this range are as small as Psychic Readings (40 seats) to the UMBC Proscenium Theater (250 seats, the arbitrary cap). Also in this range, a couple new spaces like UMBC’s Dance Cube (120 seats), and Motorhouse (190 seats). See the sidebar on the front page for a bunch more. 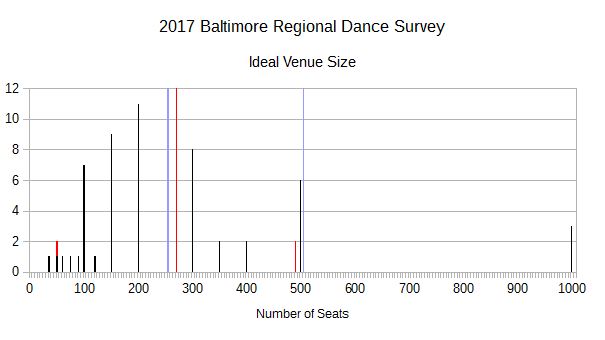 Integrating the specific performance venues used by these respondents with their ideal size, there are a number of respondents that are using venues much larger than their ideal – Kraushaar (at 1000 seats), Gordon Center (550), and BMA Meyerhoff (363) were all mentioned specifically. This isn’t necessarily a bad thing, because there are any number of positive reasons someone could perform in a space larger than their “ideal.” On the other hand, if these performers are bearing the cost of a big room that far exceeds their needs, that’s a lot of wasted money (and I do try to keep an economic perspective on things here). Within this segment, a number of non-dedicated performance spaces come up – churches, schools, hotels, community centers, restaurants, festivals, retirement communities, nursing homes, galleries, night clubs, and wherever 2016’s flash mobs happened. Such “alternative” performance spaces were very rarely mentioned by respondents with larger seating capacity expectations (a few festivals and schools were mentioned). 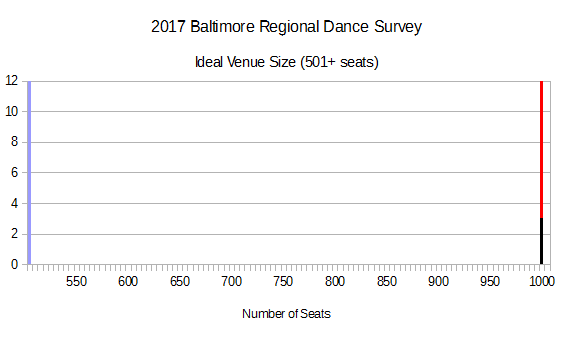 Size-specific matches are hard to do in this range, but with our target average at 142 seats, Baltimore Theatre Project (150) and Ideal Arts Space (150), offer very different production environments at that scale. Baltimore Theatre Project comes up a lot among these respondents, but no one mentioned performing at Ideal Arts Space. For dedicated dance-oriented performance space in this range, the UMBC Dance Cube is new, very well equipped, and seats 120. Aiming for the mode (200 seats) in this segment, we’re looking at places like Motorhouse (190) and Creative Alliance (210) which offer black-box-type features, Promenade (200), which is very different (dancesport-oriented). To get out of a black box or open space, it’s a bit of a step up to Slayton House (240 seats) in Columbia or UMBC’s Proscenium (250 seats) a bit closer in Catonsville.